Years ago, a friend of mine gifted me with what I still consider to be the single best party favor I have ever received: a magazine. It was unfamiliar, intriguing, and indisputably perfect, a copy of the Oxford American. I've since come to view the OA as one of those essentials in life that it is challenging to remember "before" - as in, what did we do before microwaves? I often wonder, what did I read before the OA? That first encounter with the OA also opened, quite literally, another door for me. 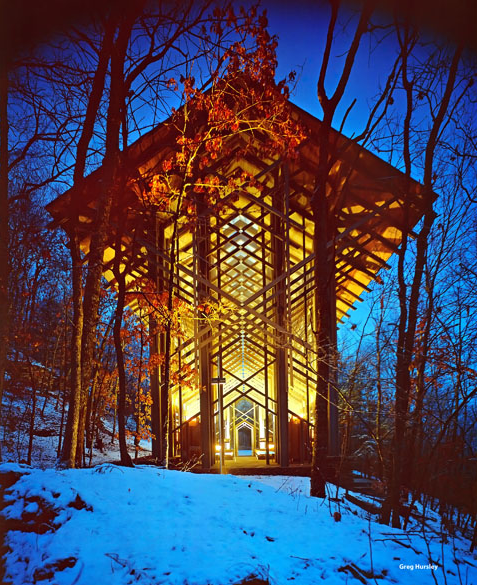 The achingly beautiful work of architect E. Fay Jones at Throwncrown Chapel, in the Ozarks, featured in that issue. 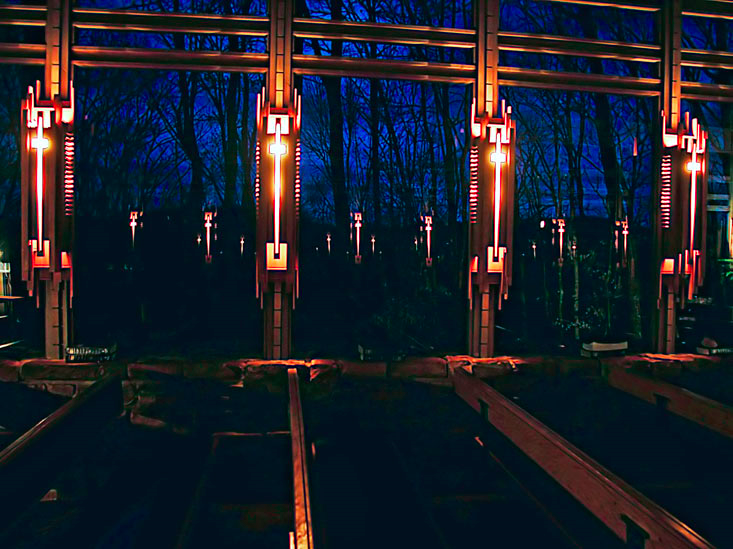 It was part technological wonder and part myth - one could imagine Frank Lloyd Wright opening the door with a hearty invitation, or perhaps one of the seven dwarves. The design was majestic, yet pragmatic too, a building of the space age, all glass and narrow limbs, barely tethered to earth. And it was a spiritual edifice, a great arrow pointing to the heavens. The grounds for Thorncrown were purchased for retiring from the world, but in that modern, post-career sense we so casually use. Here owner Jim Reed would live in repose and security, in a home especially designed for his comforts. Yet beautiful views of the mountains from this site lured many passersby, and one day while ambling up the path to the home-site, Reed thought of a chapel - a glass chapel, a respite for wayfarers, a harbor for the many wandering, and wondering, souls who passed by. 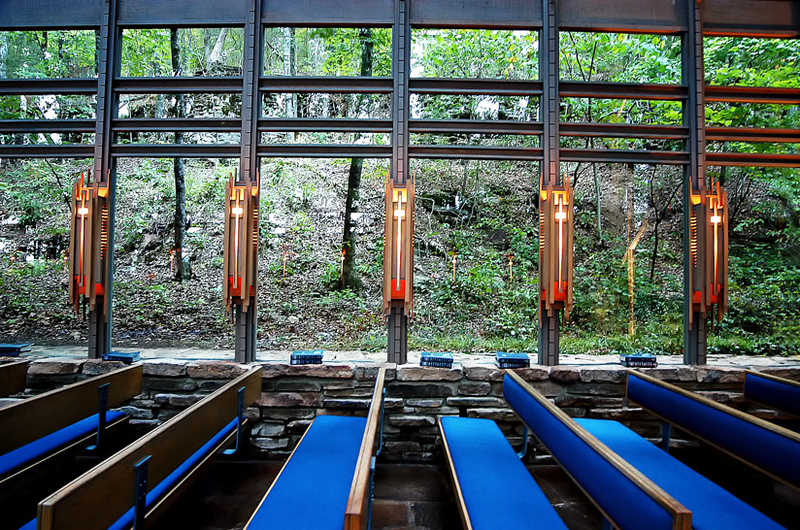 Somehow, Reed convinced Fay Jones, a former apprentice of Frank Lloyd Wright, to design this sanctuary of the woods. But as the project forged ahead, funding failed. It was not a chapel, but a folly - the half-begun skeleton of Thorncrown was more thorn than crown, an apparent testament to foolhardy whims. As he progressed one last time through the ruins of Thorncrown, convinced it would never stand, Reed was possessed by the desire to pray. He bent to his knees, for the first time in his life, on the chapel floor, to pray for help. Thus Throwncrown's first wondering soul was its own designer's, and the chapel's half finished timbers heard their first prayer as a plea to keep them standing. In days, the funding for the chapel was suddenly provided. Throwncrown would be completed, and Reed's odd little vision while walking through a wood would become a worldwide destination, and an architectural wonder. 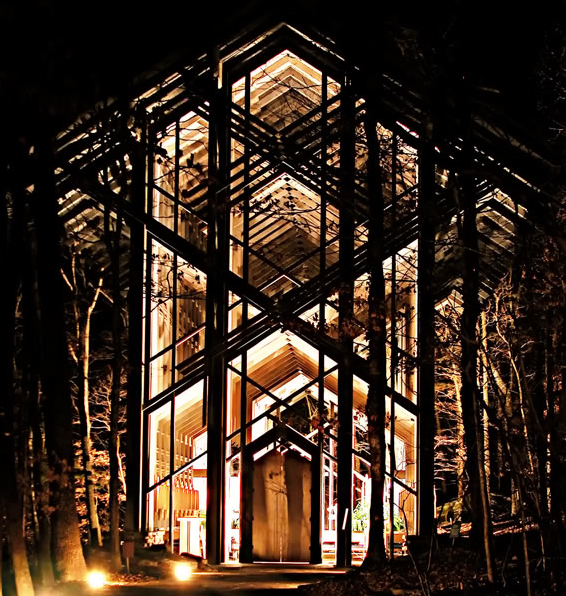 Thorncrown Chapel opened its doors in 1980, and since then, more than 5 million people have passed through them. 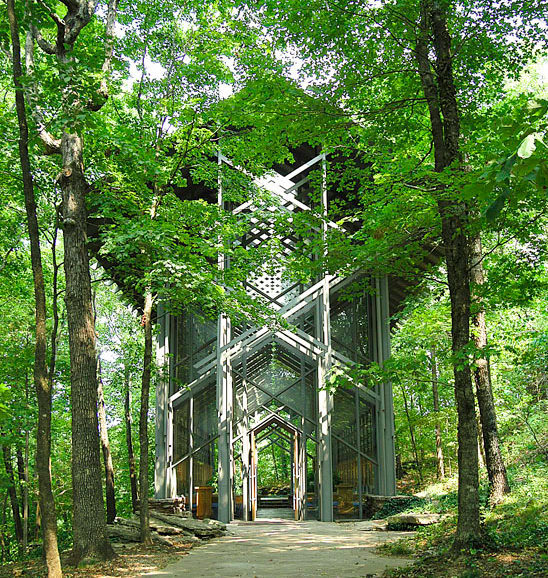 The spare interior and soaring rooflines evoke the simple expanse of the Ozark woods, inviting the great outdoors in. But it is a beautiful building because it so fluently speaks its purpose: growing up out of the forest floor, a holy tree among the earthly trees, bearing the fruits of reflection and prayer. Spectacular! It's location among all the trees seems so out of place on one hand, but it just works. How absolutely stunning!! I will go to visit as it is about 4 hours away! Such a beautiful chapel blessed by a beautiful story. I would love to visit. Thank you for sharing this beautiful place in the forest. enchantment in the woods, a great idea. Ikept thinking, I hope it is guarded. Imagine in this day and age how long all that glass would last with the devilish thoughts some people possess. Not a practical idea, but what do I know about a structure made with glass. I think it is great in all it's gleam and shine,like a gem in the woods. I am glad you posted that. Do you suppose Reed was influenced by the movie saga Lord of the Rings. Not that the glass house is like it totally, but it did make me think of it. In the forest of the elves they visited and went into the home which revolved around this tree.I forget the names of who was who. The lady of the woods and this woods was such a beautyful fantasy for me. [I always thought elves and fairies flew] It was a series of arches and rails going up winding around the tree. I looked at it to see what it would be made of and what I saw was the pattern of the arches which made me think of macrame. But still all those arches and semi circles are breath taking seen afar or as one looks up, just as this holi structure is a beautyful fantasy in the woods. If I were to file pictures of these, I would file them together. [I wonder if those windows drives the birds crazy]? AR - What an interesting point. I hadn't thought of that, but I can certainly see what an apt inspiration that would be. And yes to all - I'll bet the birds don't think it's any great shakes! I love modern architecture, this is beautiful. Thanks for pointing me in the direction of OA as well. Skyla - this is possibly my favorite post of yours I've read. What an incredibly story, inspiring architecture, and really beautifully written piece. I had never heard of it! And you can be sure I will be checking Oxford American. Really really great post! Some amazing structures! just stunning! 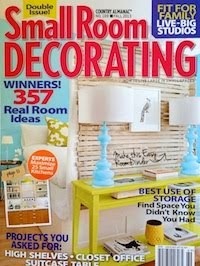 Thanks for your visit, I'm really enjoying your blog! What a stunning space! I can see how it would inspire reflection. The connection to Frank Lloyd Wright is an interesting one. It was my encounter with FLW's work that led me to architecture school. I'm very excited to have found your blog - it's the first of the many design blogs I read that take such a strong point in presenting architecture. Beautiful building - I am not familiar with it, so thank you for the introduction! How inspiring to combine human design with natural design. How extraordinary. I would love to visit that. 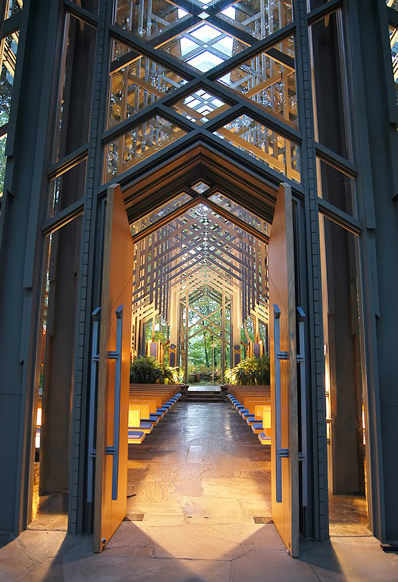 I don't often associate modern architecture with the design of truly spiritual spaces, but that chapel looks to be very moving.